As of now, you might notice that the URL in your browser looks a little different. That’s because we’ve just made TNW available on HTTPS. We always care about the security of our users, so sending data across servers just got a little bit more secure by us adding HTTPS. Next to making the web a little bit more secure there is also some more upside on enabling HTTPS; it will improve accuracy of web analytics, has potential benefits for SEO and will help us stimulate the development of our pages in AMP (as some features on AMP require HTTPS support). Also, HTTPS validates that you’re communicating with the website you actually wanted to see. 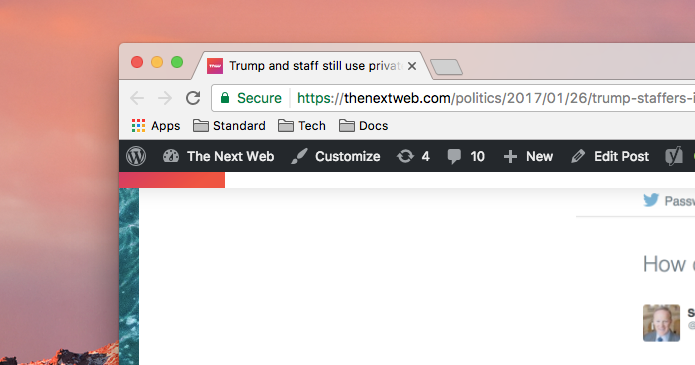 If you see the padlock in your url bar, it means that you’re guaranteed to see content we published on thenextweb.com. We’ll be doing our best to publish a post on the migration itself in our Marketing the TNW Way series soon.